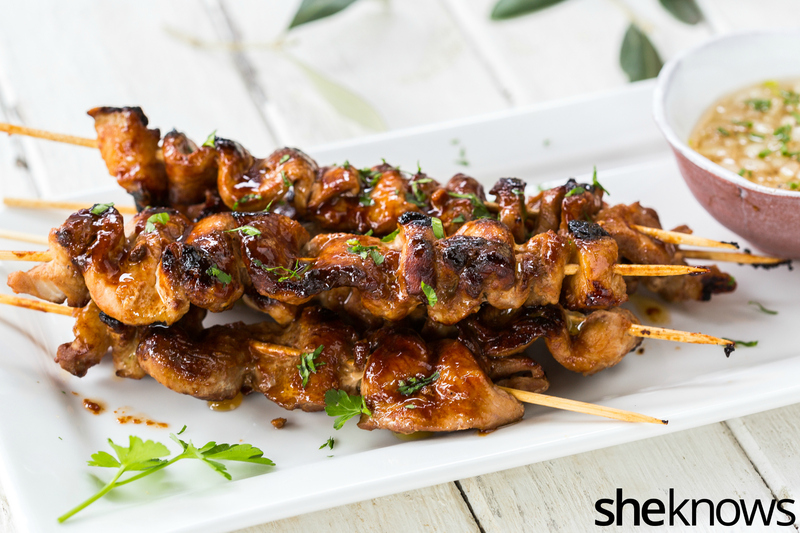 If you want these pork barbecue skewers for yourself, we have great news: You don’t even need a grill! You can make them in your kitchen on the stovetop or in the oven. Of course, you won’t have the smoky flavors that coals give, but don’t worry: They’ll still be delicious. 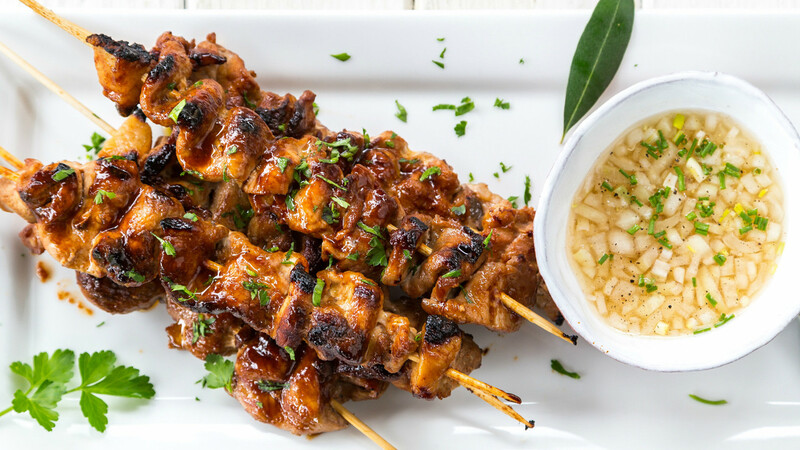 In terms of flavor, a Filipino’s basic pantry staples soy sauce, ketchup, sugar and lemon give these pork skewers tons of flavor. You might be asking yourself, “Ketchup? Why?” It may seem wild, but ketchup plays a key role in the marinade, adding a very interesting contrast of flavor with the rest of the ingredients. That said, we have one tip for you: Because cooking with ketchup leaves a sticky residue, cooking these skewers in more than one batch can harden the residue on the griddle between batches, and it can be hard to clean it off. So the best way to cook them if you are making a big batch is in the oven on a lined baking pan (and they all cook at the same time). In a small bowl, mix together all the marinade ingredients, except for the olive oil. Adjust the taste if needed. Set aside 1/4 cup of the marinade, and mix it with the olive oil. Place it in a small bowl, cover and refrigerate. Place the meat in a container with a cover, then mix it with the remaining marinade. Cover and refrigerate for 24 hours. 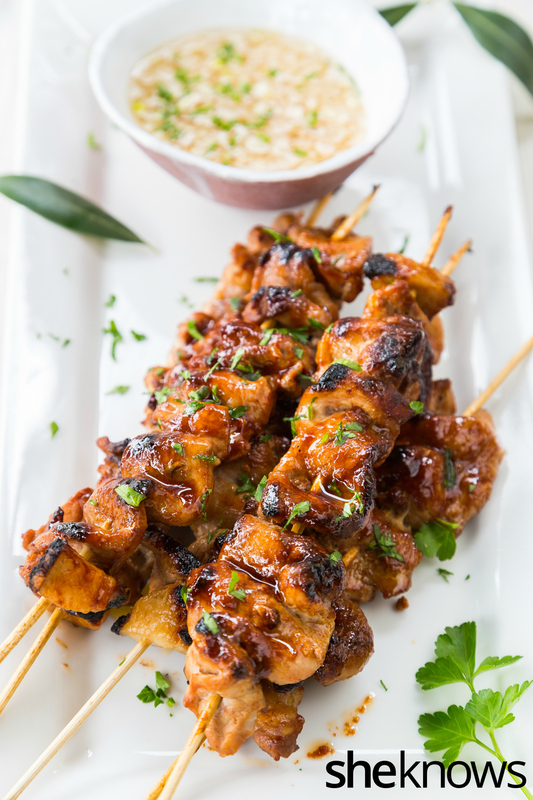 When ready to cook, discard the marinade, and thread the meat on the skewers. You can cook them two ways: on the stovetop or in the oven. If you are cooking a small batch, it’s easier to cook them on a hot stovetop griddle. If it’s a large batch, then it’s better to bake them in an oven heated to 375 degrees F for 20 – 25 minutes or until they are cooked through. While cooking, baste them with the marinade that you had set aside. Serve hot. You can serve them with a simple vinegar sauce by combining vinegar, salt, sugar, pepper and minced onions. Note: Ketchup will leave a sticky residue after cooking. If using a griddle, make just 1 batch, because the longer the ketchup stays on the griddle, the harder it becomes. Pour some water on the griddle immediately after cooking to soften the residue. If baking, line the baking pan with baking paper.